On the Beach is my favorite "ditch" record, particularly side 2, and particularly the title song and Motion Pictures). Also, See the Sky About to Rain is incredibly overlooked in my opinion. Even so, Time Fades Away, which I have a good second hand vinyl LP of, has definite moments for me: Journey Through the Past, The Bridge, and Love in Mind are beautiful acoustic tracks. I've always liked the urgency and attitude of Yonder Stands the Sinner. I do think TFA has attained a mythical/legendary status partly due to its lack of consistent availability over the years, and it's possible that the reputation would be impossible for any album to live up to for some people. Nonetheless I'm glad to hear it's being made more widely available. I love vinyl myself and in any event, I think a petition to release anything on CD is a little out of date. Indeed, Neil may be choosing now to rerelease TFA on formats other than CD because CDs are finally becoming obsolete and he feels that the current formats, including both his Pono system and the resurgent vinyl, are the best showcase for the album. Thanks for the memories Ian. Yes, you are passionate. 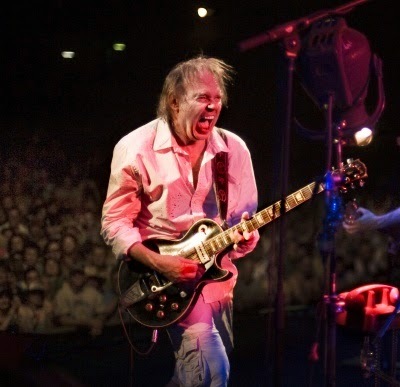 We recall on the 10th Anniversary of the release of Neil Young’s Are You Passionate? album your mentioining the alternate track listing on the post-it notes on back cover. You found that this re-ordering of tracks makes the album darker and heavier. Intriguing and we need to try and re-shuffle the tracks sometime on our PONO. In the critics' game of "Hits & Misses", Are You Passionate? often falls into the category of "Misses". But is it finally time for a re-evaluation, like much of Young's back catalog that is classified as "Misses"? Over at Ultimate Classic Rock Matthew Wilkening thinks so with the article "Neil Young’s ‘Are You Passionate?’ Turns 10 Years Old". As the camouflage, rose and romantic portrait on the cover art indicates, the lyrics on many of this album’s 11 songs deal with familiar themes of love and war. Young had toured with the famous instrumental R&B group [Booker T & the M.G.’s] as his backing band way back in the early ’90s, but it was nearly a decade before they released a record together. The Memphis Soul legends’ tight grooves and inherent professionalism provide an interesting contrast to Young’s untamed guitar on many of the songs, even if his vocals seem oddly polished on a couple of tracks. Albums In Order Review Series by Mike "Expecting 2 Fly" Cordova. As for trivia, the album's title is a homage to The Jimi Hendrix Experience 1967 album "Are You Experienced?". Also, the back cover lists song titles, all of which appear on CD except for "Gateway of Love". Go figure. Speaking of passion, see The (Dis)-Passion of A Neil Young Fan. I too really liked Are You Passionate? when it came out (other than Let's Roll, which doesn't fit in with the other material and just isn't a very good song). I always loved the riff from the title track, the Crazy Horse rocker Goin' Home, and Quit and Mr. Disappointment have a great feel to them. Too bad too many gave it a perfunctory listen and then wrote it off as another genre experiment. AYP? was Neil's current album when I began buying his music (I bought it and Decade first) so it will always hold a special place in my heart. I never really thought of similarities between AYP? and the Ditch Trilogy before, but after reading the comment I can see it. Now I think I'll go give it another spin with that in mind! I always find it interesting why Neil leaves off songs listed on the cover or in the liner notes (Gateway of Love, Get Around, If You Got Love, etc) I guess we'll finally hear the studio version of Gateway on Archives 4? He should've left them all off. It's a stinker of a record. Love discussing the lesser talked about Neil albums, and AYP definitely fits the bill. For the most part, I really liked it. Although I feel the album is thrown off course by "Goin Home", after the intense Crazy Horse stampede, the record limps until "She's A Healer" kinda picks things up. The first half of the album is pretty much tremendous. "Mr Disappointment" is great in it's brutal honesty, "Quit" and "Differently" are fun, but the highlight is the title track. 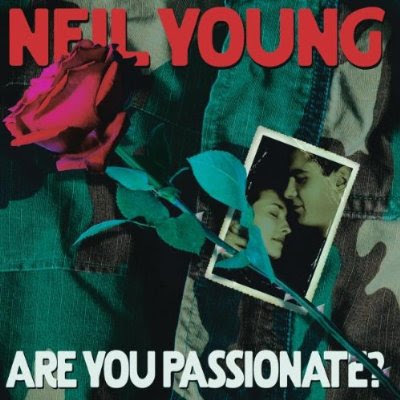 "Are You Passionate" features some of the best lyrics Neil has written in the last twenty years, the third verse an absolute killer. Hearing Neil's voice crack on the line "Well, I'm right with you" has driven me to tears more than once. Then, after that you get the incredible "Goin Home". So even though I think the album dips after the Horse song, there is plenty of good stuff to make it an enjoyable, and unique, Neil experience. Thanks, everyone, for the comments here. I'm glad to see some positive feelings here about this album, plus a few mentions of Gateway of Love and other unreleased songs. My interest in APY? does leave me enthusiastic for the (hopefully) eventual release of Toast, the unfinished Crazy Horse album that evolved into AYP? and from which Goin' Home originates. AYP? is not a perfect album, and I'm tempted to think part of the challenge is how much ground it's attempting to cover at once, but it's definitely more interesting than I think many initially released. The "many" would have to include me, as this album really did take a while to grow on me. It's not like I got to this point overnight. It's taken several years of knowing there was "something" about the album, but I just couldn't put my finger on it, so I've returned to it on and off for a while and started to appreciate some of the nuanced things about it. And full disclaimer: I'm the same guy who counts Trans and Sleeps with Angels among his all-time NY favorites, and I think Prairie Wind was a little overhyped compared to '00s albums like Silver and Gold or Chrome Dreams II. So my tastes can be a little eccentric. The edges don't quite join up at times, but that almost seems like part of the experience, and I would say the same of the actual sequence used on the CD. A question lots of people, including me, were asking when I first read the back cover photo as an alternate track list, might be Why would you put She's a Healer, a climactic piece, at the front of the album? But for me, the track actually clicked into place as an overture of sorts and tone-setter for the album, with When I Hold You in Arms and Quit actually becoming bookends. Those two songs have a lot in common, and I didn't realize it until I started listening to them as bookends, parts one two of the same story. Both songs seem to capture "passionate" between lovers and are the only songs on the album staged as direct conversation between man and woman, in an intimate environment and dwelling on the longevity of their relationship and its vital importance to them. More superficially, they're both marked by the prominence of female backing vocals and a gentle piano part interlaced with Neil and Pancho's mellow guitar licks. Maybe it's just "all one song", as we like to say far too often. No disrespect or disregard is intended for Neil's original intent and track list. For me, this has just been part of a years-long process of appreciating this album. Thanks to all and Mr Ian for insights. Once yet again, Neil fans demonstrate that they are some of the most knowledgaebale music aficionados in the universe. #1) Regarding track sequence. Did you see comment on http://neilyoungnews.thrasherswheat.org/2016/08/comment-of-moment-releasing-time-fades.html thread? The point was that track sequencing was not necessarily dictated by logic. I.e., the sonic limitations of vinyl were often the primary driver. As in, tracks with reverb and low frequencies were placed on outer (fatter) grooves while high end and treble tracks were placed on inner (thinner) grooves. #2) 'Are You Passionate?' is a tribute to Jimi & a play on his 'Are You Experienced?' album. I love this album except for Lets Roll and maybe I'm deaf but I don't hear it as a genre deviation at all. It sounds just like Broken Arrow and Greendale and Silver&Gold and even Mirror Ball and Sleeps with Angels to me. They're all amazingly beautiful albums and it was not only a time in NY's life where he was REALLY focusing on music's quality like rarely before or after, both lyrically and even more so with the quality of his voice. During the 90s he started singing low and it sounds so cool and rocking compared to the high voice he is famous for both before and since. Between the rocking guitars and almost punch drunk baritone vocals this album is almost like the 2nd coming of Joy Division more than black gospel to me. Turn up the bass and it sounds just like Ragged Glory! @Thrasher--Yes, I spotted those posts. Interesting stuff. I've always sensed that album sequence/structure is important to NY (and other artists) and, after years of listening to Neil, I feel like I've picked up on some patterns in the way he arranges the tracks on albums, so I tend to enthuse on the subject any chance I get. I think it's wonderful progress that album sequencing has come to be a matter of artistic intention, not just technical concerns. @John Tewks--Your comments are interesting, both about AYP?, and especially about Neil's low voice. I particularly noticed the low voice on Without Rings from the SIlver and Gold album, which came right before AYP?. I don't know whether Neil has consistently used a substantial lower tone or register since then, but it shows up every now and then (like Mr. Disappointment on AYP? or Bandit from Greendale. I think part of it is that he has to sing a little lower as he gets older. The live Earth album this summer provides evidence, especially in the recording of After the Goldrush. Where the original studio version of ATGR is one of those songs where Neil goes to the surreal, unearthly part of his upper range, the new live version sounds to me like it's clearly a lower register. But that's different from a conscious change of tone. Without Rings is the strongest example I can think of for Neil intentionally employing a lower vocal tone and it works very well in that case. About whether AYP? has a strong genre element, yeah, it does sound more like the same old Neil the more I listen to it, especially the heavy guitar tone and just the general subject matter of the lyrics. It's not radically deviation, but I think there's enough of a difference, I think, to to draw attention at least at the surface level and possibly distract some listeners who are interested in a really pure Crazy Horse sound and/or classic NY acoustic folk. As I said above, people will some times get too hung up on what the album sounds like on the surface. And that's especially true where it's perceived that Neil is just doing another genre thing: Trans, Shocking Pinks, International Harvesters, Blue Notes, and on. Yet my experience with many of those genre albums is that Neil takes whatever he's doing and adds his unique pedigree to it. The music and words are usually personal in some ways. In certain cases, like Trans, the entire concept arises from a deeply personal place (for Trans, the struggle to communicate with his disabled son), rather than just being an experiment or capitalizing on some trend. I don't think Neil Young has ever been one to capitalize on trends, as his going back to the country when it was none too fashionable, shows. People should try to look at these "genre" albums a little more deeply, getting beyond the fact that it just sounds a little different, and they might find some of these albums have more going for them than just the superficial. In particular:" People should try to look at these "genre" albums a little more deeply, getting beyond the fact that it just sounds a little different, and they might find some of these albums have more going for them than just the superficial. " Spot on. Many folks are always saying how Neil's all over the map, inconsistent, genre hopping, etc. As you indicate, if you get deeper into the context on many levels it can all make sense and resonate. But so many are so tuned into the surface look of things without making the effort involved in the deeper introspection. One of the small disappointments for me was media-related! I had just bought an HDCD player and Neil's first effort since I had bought it was a CD that was not encoded with that technology l! Oh the ways of Neil!!! !